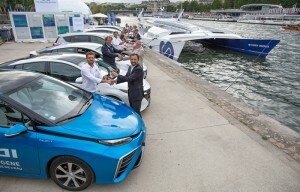 Towards a hydrogen society : Toyota France supports Energy Observer, the world’s first hydrogen-powered boat. Last month, the world’s first hydrogen powered boat set off for a 6year world tour. The goal is to be the first boat capable of producing its own hydrogen onboard from seawater thanks to solar, wind and hydro generated power. Toyota France is the official supporter of this odyssey. 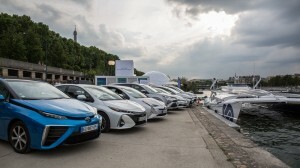 Didier Gambart, President of Toyota France, handed over 6 Toyota hybrid cars and 2 Toyota Mirai, to Victorien Erussard, Captain of the Energy Observer and its team. August 2017. Last month, the first around the world hydrogenpowered boat, Energy Observer set off on a world tour. Its goal is to be the first ship capable of producing its hydrogen “live” during stopovers and navigation. It will act as a floating smart grid system, absorbing solar, wind and wave energy. It draws its power directly from the nature, without harming it. This experimental science vessel will travel around the world during 6 years, navigating through 50 countries and stopping in 101 ports of call.Toyota France provided the crew with 8 vehicles to be used during each layover in the cities: 6 from the Toyota hybrid range and 2 Mirai. This initiative is led by Victorien Erussard, an offshore sea racer and Merchant Navy Officer, and Jérôme Delafosse, an explorer and documentary director. It is sponsored by Nicolas Hulot, French Minister of “Transition Ecologique et Solidaire”, and Florence Lambert, Director of CEALiten*. The team is highly passionate, determined to create a tightlyknit community engaged in contributing to a sustainable future. The Energy Observer will be in the following cities in France: Cherbourg from 26th August to September 3rd, Nantes from 9th to 17th September, Bordeaux at the end of September, then Marseille in October, Toulon in November and Monaco in December. The boat will then travel around the Meditteranean before heading to Northern Europe on its next leg. energy technology for the future: Based mainly in Grenoble and Chambéry (INES), CEALiten (Laboratoire d’Innovation pour les Technologies des Energies Nouvelles Laboratory for Innovation in New Energy Technologies) is one of Europe’s most important centres for research into new energy technologies. We are very happy to have Toyota, leader in hybrid and hydrogen, as our official supporter. Toyota carries the same drive to fight global warming and air pollution. The goal of Energy Observer is to unite all natural energies, but also the ones of our society. 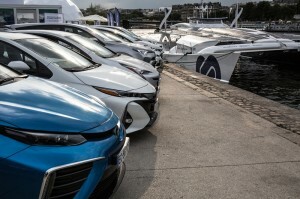 We want the expertise of companies such as Toyota, as well as laboratories, startups and institutions united around our boat Victorien Erussard, Captain of Energy Observer“ to support France’s efforts to diversify its energy mix, in particular to meet energy requirements in transport, housing and mobile electronics. It also seeks to make businesses more competitive. CEALiten works hand in hand with industry with 400 research partnership contracts every year and is one of the CEA laboratories with the most patents (185 patents filed in 2011, 200 in 2012), managing a portfolio of 840 international patents. CEALiten is a major European research institute and a driving force behind the development of the sustainable energy technologies of the future. The institute is spearheading the EU’s efforts to limit dependency on fossil fuels and reduce greenhouse gas emissions in three key areas: renewable energy, energy efficiency/storage and development of materials. ministro francese della "Transition Ecologique et Solidaire"